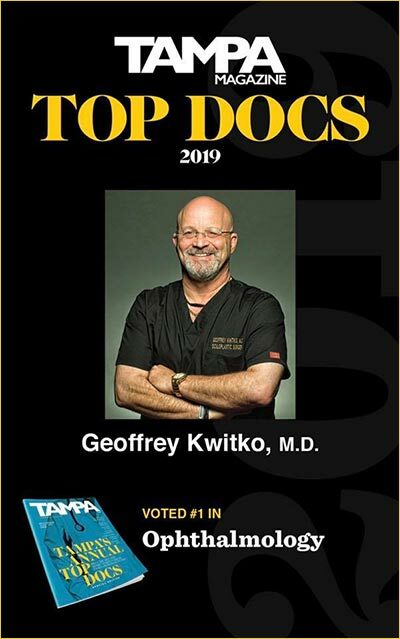 Tampa and Bay Area Dr. Kwitko proudly serves the Thyroid Eyelid Surgery needs of Residents in Tampa, St. Petersburg, Clearwater, Largo, Hillsborough County, Pinellas County and throughout the Bay Area in West Central Florida. 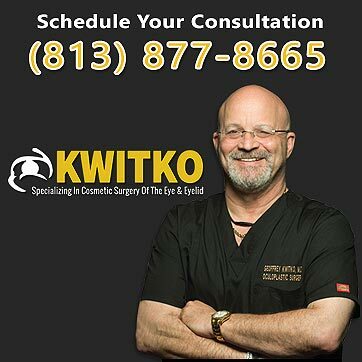 Call 813.877.8665 today to schedule a confidential consultation with Oculoplastic Surgeon, Dr. Geoffrey Kwitko about your Thyroid Eyelid Surgery needs and goals. When Graves’ disease – an autoimmune disorder that leads to over activity of the thyroid gland or hyperthyroidism – affects the eye, the resulting progressive condition is known as thyroid eye disease (TED). TED normally appears before the age of 40, although patients of any age who have Graves’ disease or a family history of Graves’ disease may develop TED at any age. The presence of too much thyroid hormone in the body may cause the soft tissues and muscles surrounding the eye to swell. When these structures swell inside the eye’s orbit – the boney cavity in which the eyeball is housed – the eyes protrude or bulge, leading to problems that, if not corrected could lead to loss of sight. Although thyroid eye disease is a potentially blinding medical issue, with the right diagnosis, treatment and follow-up, most of the problems can be prevented. 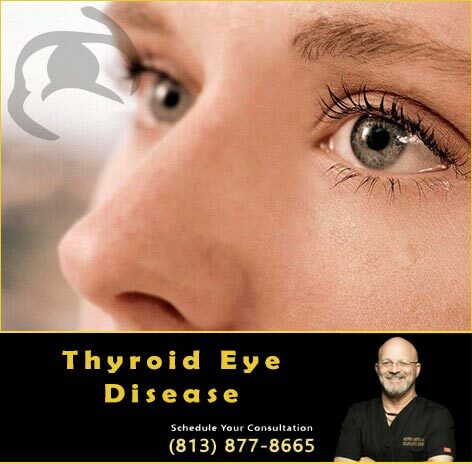 Because thyroid eye disease does not disappear once normal thyroid levels are reached, accurate diagnosis and treatment of the disease is critical to restoring and preserving healthy eyes. What are the most common symptoms of thyroid eye disease? 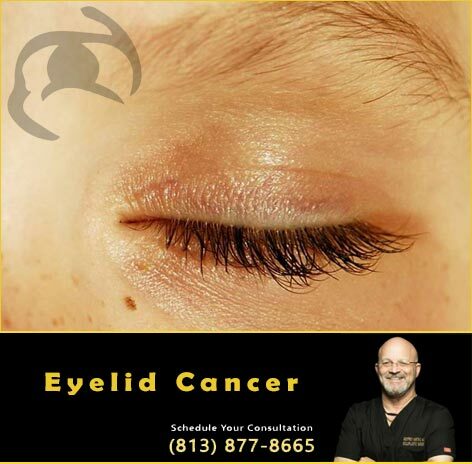 If you have TED, you may be affected by such symptoms as eyelid retraction, eyelid protrusion, double vision, dry eye or eye bags. Eyelid retraction results from a combination of the eye swelling and protrusion. The eyelids retract and reveal the sclera or white part of the eye. Eye protrusion occurs when the muscles around the eyes swell, which pushes the eyes forward. People exhibiting this symptom look as if their eyes are bulging or as if they are staring intently. Dry eye, or a lack of a tear film to make the eyes’ surface smooth and clear, causes the eyes to be over-exposed to the environment and could ion is that it relieves the pressure on the optical nerve. If this pressure is not relieved, vision impairment, and possibly blindness, could result. Eye bags are a result of eyelid swelling which can cause the tissue around the eyes to bulge forward. Loss of sleep although not a symptom by itself, can be directly related to the pain caused when your eyes are unable to close properly and become dry, itchy, or watery. If you have been diagnosed with Graves’ Disease or have a family history of the disease, and experience any of these symptoms – even in mild form – you should consult a doctor as soon as symptoms begin to appear. If you are a woman, you are much more likely to develop Graves’ disease, and therefore TED. Graves’ disease normally appears before the age of 40. In addition, if you have Graves’ disease and you smoke, you may be increasing the likelihood you will develop TED. The most effective means of diagnosing TED is for your doctor to thoroughly understand what is causing your eye discomfort. If you are affected by Graves’ disease, you should pay close attention to your eyes and seek help as soon as your experience eye discomfort from any of the symptoms described above. Although your symptoms may be mild, non-specific, or thought to be related to an allergy or inflammatory issue, keep in mind that when taken as a group and considered in light of the presence of Graves’ disease, even mild symptoms can be an early warning that TED may be present. What are the treatments for thyroid eye disease? Once normal thyroid hormone levels are achieved, the symptoms of TED can be treated with surgical or non-surgical methods depending on the severity of the disease. Non-surgical treatment can include taking steroid medications orally to control swelling and inflammation of the eye muscles, wearing sunglasses to relieve light sensitivity, and applying lubricating ointment to relieve dry eye. Surgery on eye muscles to help treat double vision. 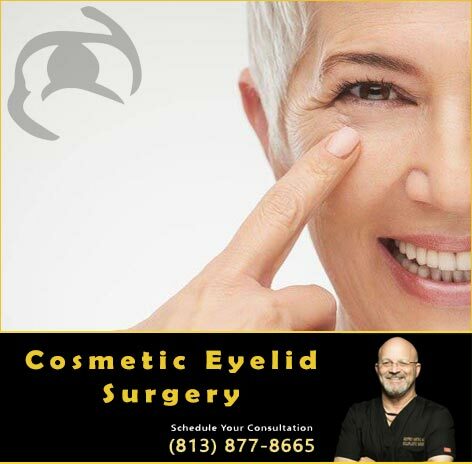 Eyelid surgery to correct eyelid retraction and help protect the eyes. Orbital decompression, for advanced cases of TED, to relieve the pressure of swelling and allow the pressure to expand beyond the eye socket to eliminate eye protrusion. All these surgical treatments are safe, effective and commonly performed procedures. Local anesthesia and IV sedation are available. Surgery is performed on an out-patient basis in a hospital setting. What is eyelid retraction surgery? After the inflammatory stage of TED is treated, eyelid retraction surgery can be performed to enhance the appearance of your eyes and restore normal eye functionality. This surgery can be performed on the upper or lower eyelid. Upper eyelid retraction surgery involves loosening the retractor muscles holding up the eyelids, allowing the eyelids to drop to a more normal level. Lower eyelid retraction surgery uses spacer material, such as a collagen graft, to reconstruct the lower eyelids in order to boost them upward. How can eyelid retraction surgery benefit me? Eyelid retraction surgery can be performed on both upper and lower eyelids to provide increased protection to your eyes and allow them to function normally. In addition, the surgery improves the aesthetic look of the eyes – eliminating the appearance of bulging or staring eyes. What is orbital decompression surgery and what are its benefits? Orbital decompression surgery is normally performed on patients with advanced cases of TED. This surgical procedure relocates the bones around the eye, allowing more space for the swollen tissue so that it doesn’t press on the optical nerve. The most important benefit of orbital decompression is that it relieves the pressure on the optical nerve. If this pressure is not relieved, vision impairment, and possibly blindness, could result. Why should I select dr. Kwitko to treat my thyroid eye disease? 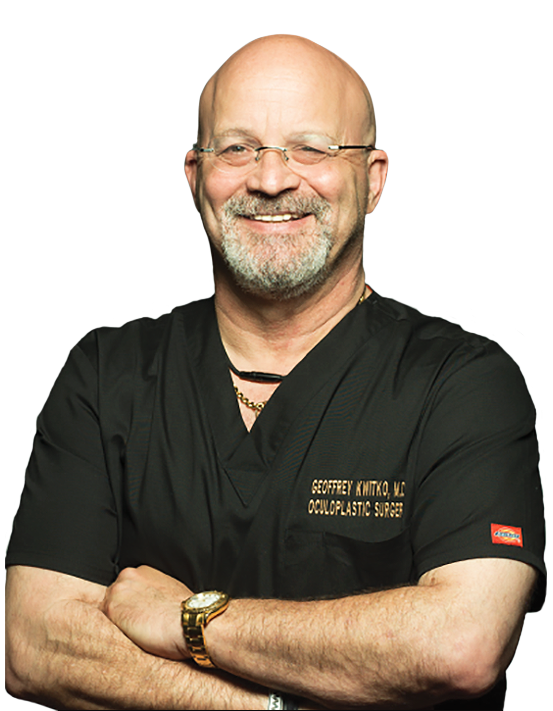 Dr. Geoffrey Kwitko is the only oculoplastic surgeon in the Tampa Bay Area who also has expertise in orbital surgery and neuro-ophthalmology. 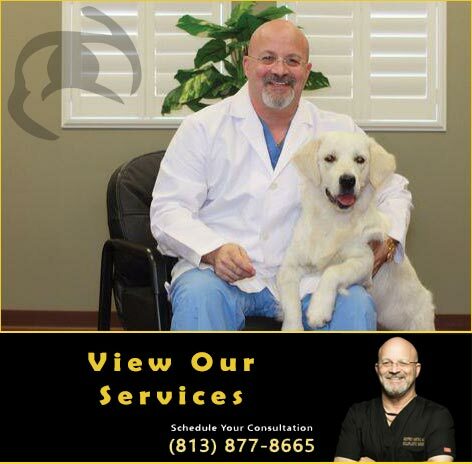 His training is specific in regard to those fields and he is board certified and fellowship trained in oculoplastic and neuro-ophthalmic surgery. Call 813.877.8665 today to schedule a confidential consultation with Oculoplastic Surgeon, Dr. Geoffrey Kwitko about your Thyroid Eyelid Surgery needs in Tampa, St. Petersburg, Clearwater, Largo, Hillsborough County, Pinellas County and throughout the Bay Area in West Central Florida.